As of 11/22/13 (incorporating data through 11/15/13) the WLI was at 132.2 and the WLI, Gr. was at 2.4%. As per the November 27 press release, the LEI was at 97.5 and the CEI was at 106.9 in October. 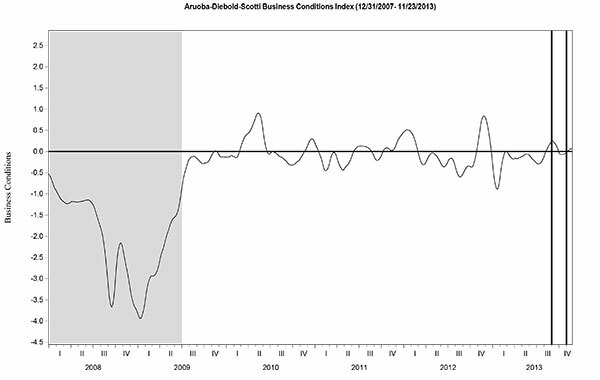 This entry was posted in Economic Forecasts and tagged ADS Index, Aruoba-Diebold-Scotti Business Conditions Index, Chicago Fed National Activity Index, Conference Board CEI, Conference Board LEI, economic forecasting, economic indicators on November 27, 2013 by Ted Kavadas. This entry was posted in Economic Forecasts and tagged Economic Forecasts, economic indicators, STLFSI on November 27, 2013 by Ted Kavadas. 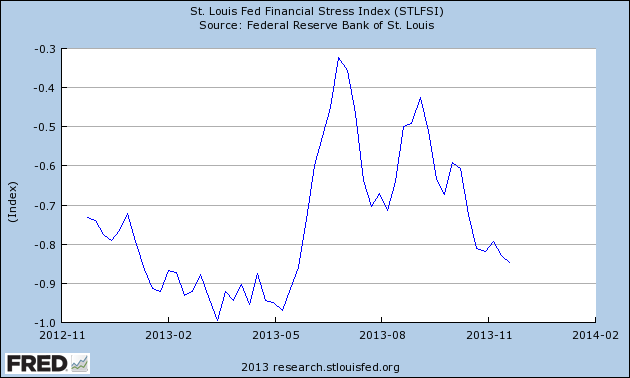 This entry was posted in Uncategorized and tagged economic indicators on November 27, 2013 by Ted Kavadas. 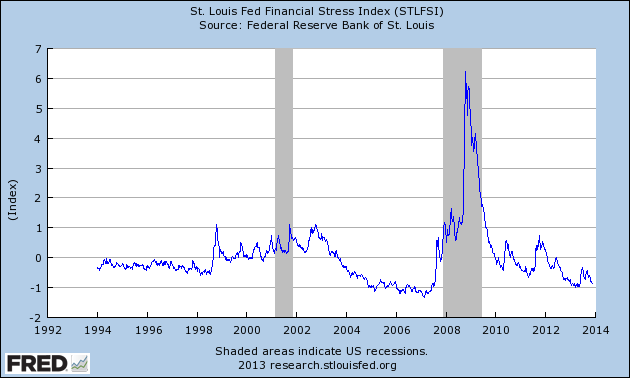 This entry was posted in Uncategorized and tagged Consumer Confidence on November 27, 2013 by Ted Kavadas. 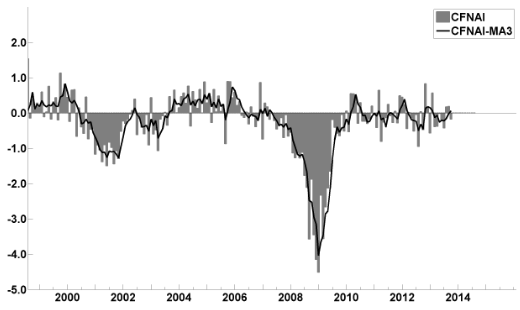 The Philadelphia Fed Fourth Quarter 2013 Survey of Professional Forecasters was released on November 25. This survey is somewhat unique in various regards, such as it incorporates a longer time frame for various measures. As for “the chance of a contraction in real GDP” in any of the next few quarters, mean estimates are 11.3%, 11.1%, 11.6%, 11.7% and 12.2% for each of the quarters from Q4 2013 through Q4 2014, respectively. As well, there are also a variety of time frames shown (present quarter through the year 2022) with the median expected inflation of each. Inflation is measured in Headline and Core CPI and Headline and Core PCE. Over all time frames expectations are shown to be in the 1.1%-2.3% range. This entry was posted in Economic Forecasts and tagged Economic Forecasts on November 26, 2013 by Ted Kavadas. 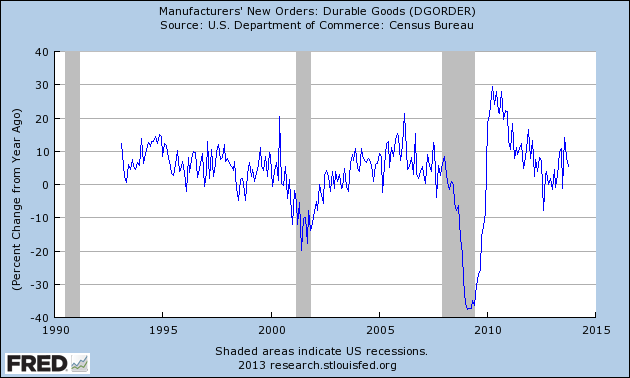 The data was last updated November 8, 2013, reflecting August 2013 levels. Here is a table showing various monthly statistics with regard to national participation and costs going back to FY2010. As seen in this table, the number of people participating as of August 2013 is 47,665,069, up 1.19% from year-ago (August 2012) levels. 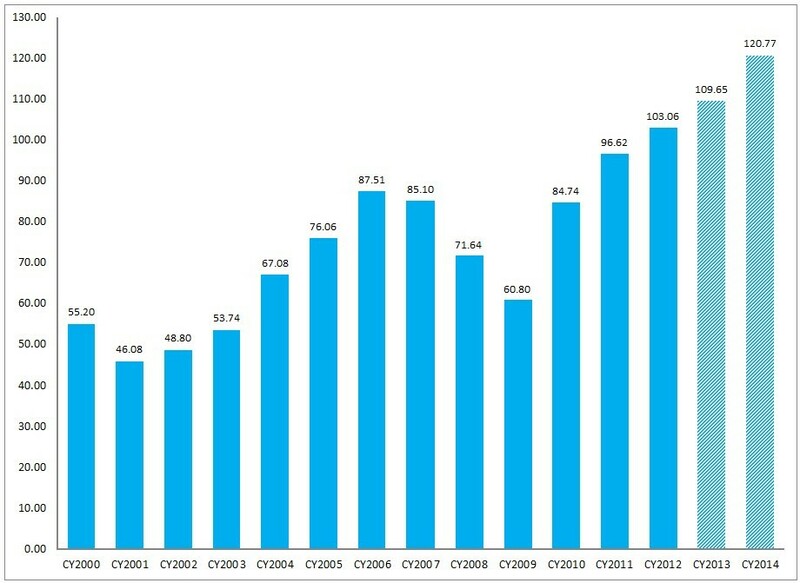 As a reference point, the figure as of June 2009 (the official end of the recession as defined by the NBER) was (originally stated as) 34,882,031. Longer-term annual data is also available. This entry was posted in Uncategorized and tagged food assistance on November 25, 2013 by Ted Kavadas. With regard to our current economic situation, my thoughts can best be described/summarized by the posts found under the 30 “Building Financial Danger” posts. My thoughts concerning our ongoing economic situation – with future implications – can be seen on the page titled “A Special Note On Our Economic Situation,” which has been found near the bottom of every blog post since August 15, 2010. This entry was posted in Uncategorized and tagged current economic situation on November 25, 2013 by Ted Kavadas. 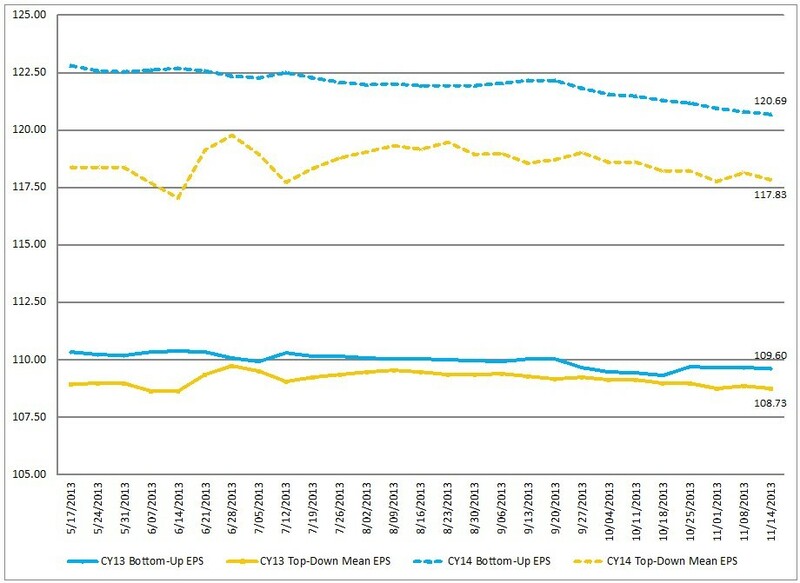 Below are three long-term charts, from Doug Short’s blog post of November 22, 2013 titled “ECRI Recession Watch: Weekly Update.” These charts are on a weekly basis through the November 22 release, indicating data through November 15, 2013. 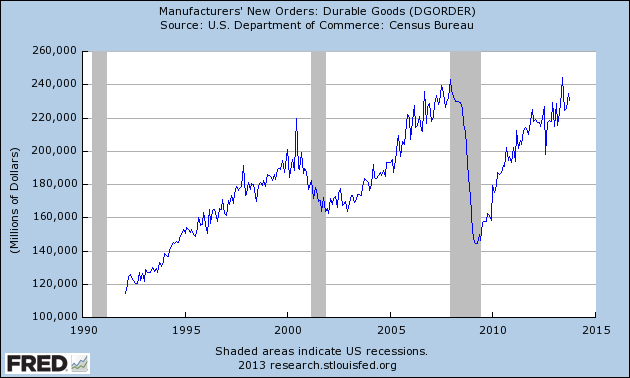 This entry was posted in Economic Forecasts and tagged ECRI on November 23, 2013 by Ted Kavadas. This entry was posted in Investor, Stock Market and tagged S&P500, S&P500 Earnings, Stock Market on November 22, 2013 by Ted Kavadas.